There's nothing more beautiful than fall colors present in flowers and Floral Art gives you that and much more. It's an elegant design that would be perfect for a Thanksgiving dinner with the family. It's a unique look that embraces all of fall's colors. Enjoy the holiday dinner and when done, just sit back and relax. Disposable plates and cups make clean up a breeze and you can spend more time with family and friends. 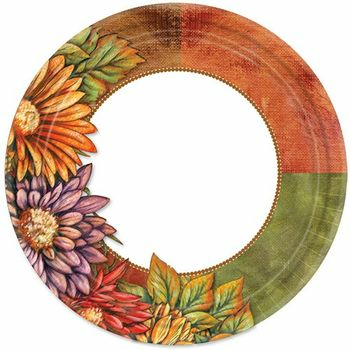 Floral Art 10.25" Thanksgiving Banquet Paper Plates, 18ct. Floral Art 7" Thanksgiving Dessert Paper Plates, 36ct. Floral Art Thanksgiving Luncheon Napkins 40ct. Floral Art Thanksgiving Buffet / Guest Napkins 14ct. Floral Art Thanksgiving 9oz. Hot / Cold Paper Cups, 24ct.